The Los Angeles City Council voted Friday to review a revocable permit for a large warehouse owned by a major trucking company over concerns about its labor practices. The unanimous vote against California Transload Services comes on the same day the Teamsters announced that some drivers and warehouse workers who work for its parent company, NFI Industries, and another port company would be going on strike. The City Council vote asserts its jurisdiction over a decision by the civilian board that oversees the port to grant the permit, and came at the request of Councilman Joe Buscaino, who has been heavily critical of the company in the past and represents the port area. “Before another agreement is approved it’s imperative I feel that the city should ensure that operations at the Port of Los Angeles are not affected by a labor disruption,” Buscaino said. The move is one of a series taken lately by Los Angeles city leaders as they seek to pressure trucking and warehouse companies at the port to stop classifying drivers as independent contractors. Some drivers and unions have been arguing for years that labeling them contractors is a scheme to deny them just compensation and benefits. The vote did not necessarily overrule the Board of Harbor Commissioners, but allows the City Council to take over the issue of the permit. In May, the City Council asserted jurisdiction over another vote of the Board of Harbor Commissioners to extend a Foreign Trade Zone Operating Agreement at the same warehouse on port property in Wilmington. The warehouse had been operated in the past by Cal Carthage, but in October 2017, NFI Industries acquired Cal Cartage, and NFI’s subsidiary company, California Transload Services, became the successor to Cal Cartage at the warehouse. Buscaino chaired a meeting of the Trade, Travel and Tourism Committee last year where truckers and warehouse workers spoke about alleged labor abuses that result from their classification as independent contractors instead of employees. “One of these companies that workers reported was one of the most egregious in violations was Cal Cartage,” Buscaino said, before noting that the company had been taken over and renamed. Buscaino said state and regulatory agencies have alleged numerous violations of labor, employment and health and safety and tax laws involving Cal Cartage over the last three years. “Today’s vote is unfortunate but we look forward to using this as an opportunity to educate the City Council and community-at-large about the positive steps NFI has taken since purchasing the Cal Cartage companies less than a year ago,” NFI said in a statement. The issue of companies at the Port of Los Angeles and the Port of Long Beach classifying drivers as independent contractors has been a focal point of 15 strikes at the port in the last four years, and the pending Monday strike will be the 16th. According to a USA Today investigative report published in June 2017,there are around 800 companies regularly operating at the L.A. ports, and almost all of them turned to some form of a lease-to-own trucking model after California banned older trucks from entering the ports in 2008. Since the USA Today investigation, L.A. leaders have been putting more pressure on companies to change their business practices. In January, City Attorney Mike Feuer sued three Port of Los Angeles trucking companies over their practice of classifying truck drivers as independent contractors, alleging it bilked them out of fair pay and benefits while also shifting operating costs onto their shoulders. The lawsuits were brought against CMI Transportation LLC, K&R Transportation California LLC and Cal Cartage Transportation Express LLC. All three of the companies were owned by Cal Carthage until last October, when they were sold to NFI Industries. The City Council also voted in December 2017 to explore banning companies that use the practice of independent contractors from the port. The pending strike on Monday will involve drivers and warehouse workers for NFI and another company, XPO Logistics, although it was unclear how many workers would be striking at the ports of Long Angeles and Long Beach. 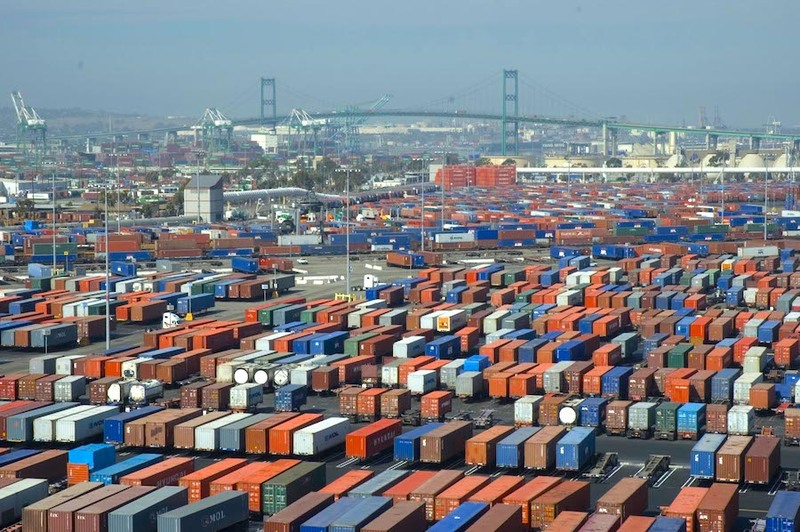 Through its Justice for Port Drivers campaign, the Teamsters union said that XPO has 280 drivers working at the L.A. and Long Beach ports, and that NFI has 600 drivers and 500 warehouse workers. NFI said a recent unionization effort at the NFI warehouse failed. “It’s unfortunate that the Teamsters have elected to pursue this action despite the overwhelming rejection of union representation by the vast majority of Cal Cartage’s Wilmington warehouse workers. Even though the Teamsters have failed on several occasions to organize these warehouse workers,the Teamsters have been unwilling to accept the voice and the vote of the employees, who have the absolute right to determine whether or not to organize,” NFI said.